Would you just look at these earrings on the cover by Claire Lockwood?! If you're not familiar with Bead Chat Magazine, it's an online magazine started by Melinda Orr and run by her, Linda Younkman, Cynthia Machata, and Natalie McKenna with several other amazing jewelry artists as contributors. 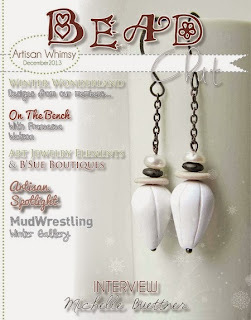 What started as a Facebook group of bead, jewelry and mixed media artists sharing information, supply links and support for each other turned into an amazing online community called ArtisanWhimsy.net and it's definitely the 'hub' of our "beady-world". 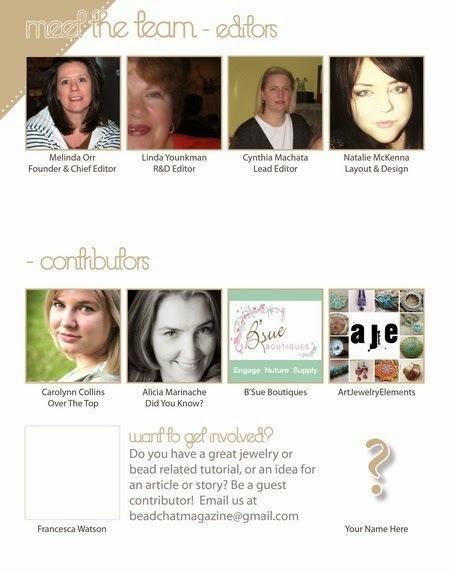 And the online monthly magazine, Bead Chat, is the icing on the cake (if you ask me). 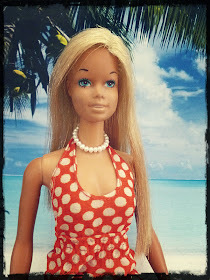 Cynthia over at Bead Chat Magazine contacted me a couple of months back to say they would like to do an interview with me and feature pearls in their December issue and believed I was their "Go To Pearl Girl". Over the past several weeks, Cynthia, who writes amazingly well for the magazine, Natalie, who does a fantastic job on the photos and layout, and I exchanged emails, links, photos and details and they managed to put together an outstanding interview and Pearl Article complete with supplies links, knotting tutorials and educational information. And for this, I am truly grateful. These two women are professional and super fun, creative (indeed!!) and just all around good people! I have to say 'easy to work with' is an understatement. They take everything you give them and turn it into beautifully laid out, eye-catching content and interesting words! There's quite a few people, many of whom I didn't get to converse with, who, on a monthly basis really put their heart and soul into this magazine and make it the successful and much enjoyed magazine that it is. Each month, the entire staff and their contributors work around the clock (from what I can tell!) to bring those of us in the bead and jewelry crafting world one of the most top notch magazines related to our industry - online or in print (IMHO, anyway). In the pages of Bead Chat you will find links to tutorials, fun interviews, feature articles on really interesting and talented artists, helpful tips, trends within our industry and completely amazing photos of all types of jewelry - super stuff! 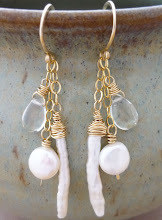 Super Cool Earrings by Lisa Lodge! 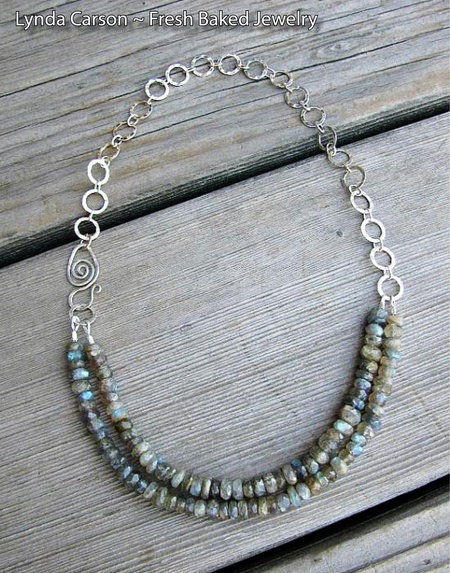 Beautiful Shimmering Necklace by Lynda Carson! Thank you again to everyone involved with Bead Chat, you're greatly appreciated and deserve all the kudos you are getting online from all of us in the beading/jewelry world! So, whatcha waitin' for? Head on over and take a peak inside! Peace, Love and Feeling Grateful (and excited)! I came over here to say what an awesome interview you gave! 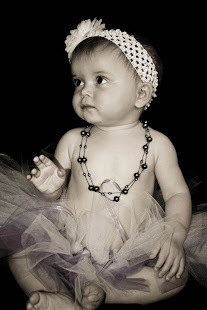 Always learning something new from you about pearls. Especially designing with leather!! My personal favorites of your work. You make such beautiful things, it was a wonderful article. 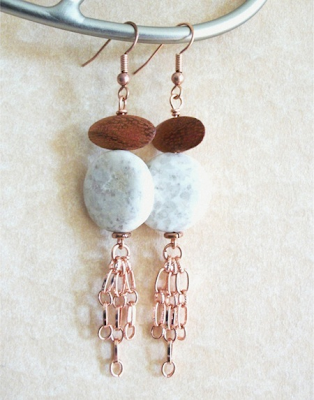 I'm always thrilled to see some of my copper pieces used in a feature as well of course. Well done! Thank you so much Kristi! And, you'll be happy to know that my friend who has those earrings w/your awesome components just LOVES them!! Thanks Cynthia - I meant every word. You guys were a 'gem' to work with and you made everything look so perfect! Thanks so much Melinda. You really do have a fabulous magazine and everyone who works on it is truly a 'class-act'! Michelle, thank you for the post. Is there any way to make the magazine itself full screen? (if anyone else knows, please, do tell) Each month I try to read it hunched over my computer. I have a very large screen for a laptop (couldn't even find a lap top bag to fit this baby!) but with the magazine taking up such a small percentage of the screen, I just can't see to read it.....ok,ok, my eyes are not what they once were. I can see the pictures while leaning in very close, but I can't read it. I try each time but end up giving up in eye strain and frustration. Please, any help would be greatly appreciated here. Let me know if that helps - If not, I'll try to see what else I can do for you.